A quiet rumination on exile, photography and transplanting roots, this short tells the story of two women: an aging refugee and a photographer/daughter of refugees. Prysia’s Garden is a collaboration between filmmaker Mišo Suchý and photographer Lida Suchy. Mišo is an émigré from the former Czechoslovakia; Lida is a first generation American who grew up in a refugee family. Mišo’s films were exhibited at Oberhausen, Krakow, Cinéma du Réel Paris, Jihlava, Cinematexas, Yale University, Cornell Cinema, Hallwalls Contemporary Arts Center and George Eastman House. In 2015 International Film Festival Bratislava, Slovakia, presented a retrospective of Mišo’s films. Lida’s photographs are in the collections of SFMoMA, Brooklyn Museum, Bibliothèque Nationale Paris. She is a 2016 Guggenheim Fellow. Mišo teaches film at the Department of Transmedia at Syracuse University. Lida teaches photography at Onondaga Community College. 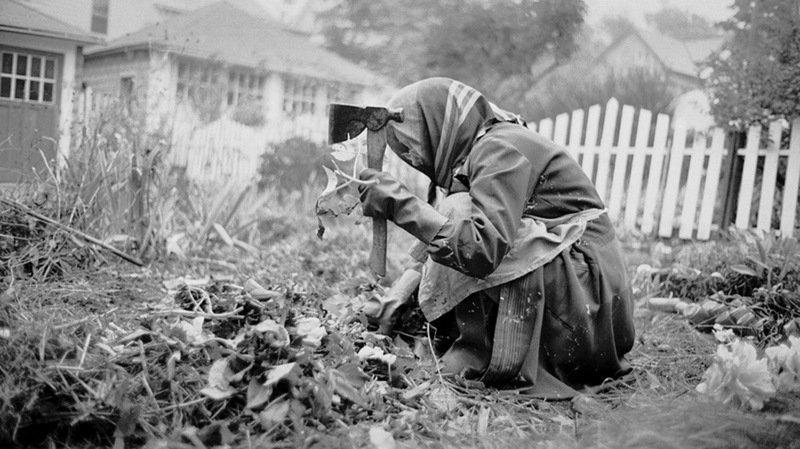 An intimate meditation on exile and home, Prysia’s Garden portrays the quiet life of aging Ukrainian refugee Prysia through the detailed photographic lens of first-generation Ukrainian-American Lida Suchy. By confronting Prysia’s story, Lida reflects upon her own roots, looking to understand what makes a new place a home.